One of my love languages is gift giving. I love to give things to others that makes them smile and know that they were thought of. Perhaps that is why giving away prizes at our Stamp Camps is always a highlight for me. One of the fun things we do at Stamp Camp is create hand stamped prizes. Each of the members of my fabulous event team creates a hand made item to be a part of our prize patrol. Today's post will feature the 5 prize patrol items created by my fabulous team as well as some of our grand prize winners! The first prize was made by Berdina. This lovely hard cover blank journal is so pretty. When I saw this book I loved the stamping but didn't recognize the images. Berd explained that it is from the set called Penned and Painted on page 143 of our Stampin' Up! 2016-2017 catalog. The reason I didn't recognize it is that Berd didn't use the outline image which when you use it gives it an entirely different look. This is one of Berd's favorite stamp sets and now we are both sad it is retiring this year. I love Berd's simple style. This journaling book is not only beautiful but also very useful and would make a great gift. Norine created a tiny gift and note card set. The little note cards were tucked inside this adorable bag. Norine explained that this idea came from a larger bag her friend Iris had given her and she wanted to try and make it smaller to hold a gift card and a note card. The two of them worked together and created this adorable tiny tote pictured below. I think it came out absolutely adorable, don't you? Zeny's gift was next, she was inspired by a video tutorial she saw by Stampin' Up! demonstrator Kelly Acheson. Kelly had created this amazing die cut box and Zeny is passionate about creating boxes so she couldn't wait to give Kelly's box a try. Zeny shared a bit about how she made the box and showed how she created it in different colors. Here is a close up of the box she made in Mint Macaroon. Isn't it nice? Would you like to try and make this? Well Kelly Acheson has an amazing video you can watch by clicking here. Then you can create one of your own. Thank you Kelly, for your inspiration! Jodi's project was this cute note pad holder with a critter on it. Jodi is our Critter Queen and basically everything she makes is simply adorable, just like Jodi. Jodi used the stamp set Playful Pals, which is one of her favorite sets that is also on the retired list. If you would like to learn how to recreate this project you can go to Jodi's blog "The Stamping Owl" by clicking here. I was happy to learn that some of you have already been duplicating Jodi's project since coming to stamp camp! For my prize patrol I created a tea box that was designed by Stampin' Up! demonstrator Rina Meushaw. I copied Rina's template exactly because I thought it was so perfect, I love Tazo Tea's and thought the winners of this prize would enjoy them too. I incorporated the Watercolor Wings stamp set as well as the Succulent Garden Designer Paper that was featured on all of our stamp camp projects. The green circle and word "hello" came from a brand new stamp set called Eastern Beauty that is an early release stamp set from our brand new Stampin' Up! catalog that will be out June 1st. This project was made by using our envelope punch board and it was really quick and easy. I know I will be making more of these adorable tea boxes in the future. I spoke with Rina and she was happy that we were inspired by her project. Rina has an excellent You Tube video tutorial explaining how she created this box. If you'd like to see it you can click here and she will give you complete instructions on how to recreate this adorable project. Thank you Rina for your inspiration! I was thrilled that the recipients of our prize patrol prizes were all very happy with what they received. Another giveaway that happens at the end of our event is our Grand Prize baskets. Each of the demonstrators on my event team create a themed basket full of Stampin' Up! products. It is fun to see what everyone comes up with. This year my prize basket contained many of the items from our Succulent Garden Suite and I even included a real succulent plant with the prize. It is always so exciting to call out the names of the winners and celebrate with them at the end of our camp. As I focus on gifts today, one of those that was evident at our event was the gift of love and friendship. I was so blessed to work with this amazing team. I can't thank them enough for all the hard work they did at this event. They give so much not to get credit or glory for themselves but really with hearts that genuinely care about the people attending wanting them to have a good time. I so appreciate the effort they gave in assisting Pam set up her table as she had injured her wrist earlier that week. 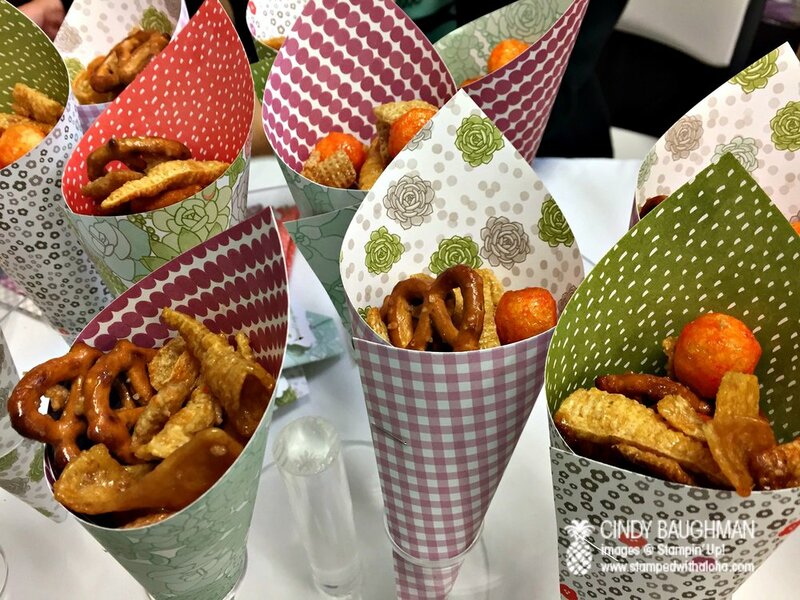 They helped her role these adorable cones to hold a delicious snack mix Pam had made. They helped her stuff Green Tea Kit Kat bars in these adorable flower pot favors she created. And they also helped her set up all the wonderful touches that were done with a heart to bless our guests and make them feel special. Isn't Pam's butterfly plant decoration adorable. I think the sentiment on this adorable plant pick perfectly expresses our wish that everyone who came would experience a perfect day. As our guests left I felt overwhelmed with all the hugs and compliments that were shared. It made me feel so happy that everyone truly did have a wonderful experience at Stamp Camp. It was also a gift to see how our guests bonded as they spent time together. I am glad that new friendships were formed and old friendship were strengthened. As Wanda and Olivia left Wanda thanked Olivia for all the help she gave that day. Normally Wanda would take a lot longer to complete her projects but with Olivia sitting by her guiding her, she was able to finish her projects in record time. It made me so happy to see so many people working together enjoying creativity and having fun. From the moment we prayed over these seats asking for God's blessing over this event until the moment we packed everything up and cleaned up the room, I was grateful for the gift of having this special time together. A special thanks to all of you who attended this event. We felt so happy to know you had a wonderful day. We look forward to having another stamp camp in the future but until then we will look back upon this experience and what a gift it was to have you there. Thanks to all of you who also joined the fun just by following my posts and letting me know how much you enjoyed seeing and learning about these Spring stamp camp projects. Since this post was about gifts, I want to end it by reminding you of something. I hope each of you will know that from the moment you opened your eyes this morning you were given a precious gift, the gift of life! God has blessed you with a new day to experience His amazing love for you. My prayer for you is that you would come to an understanding of how much you are loved and then go out and spread that love with others. 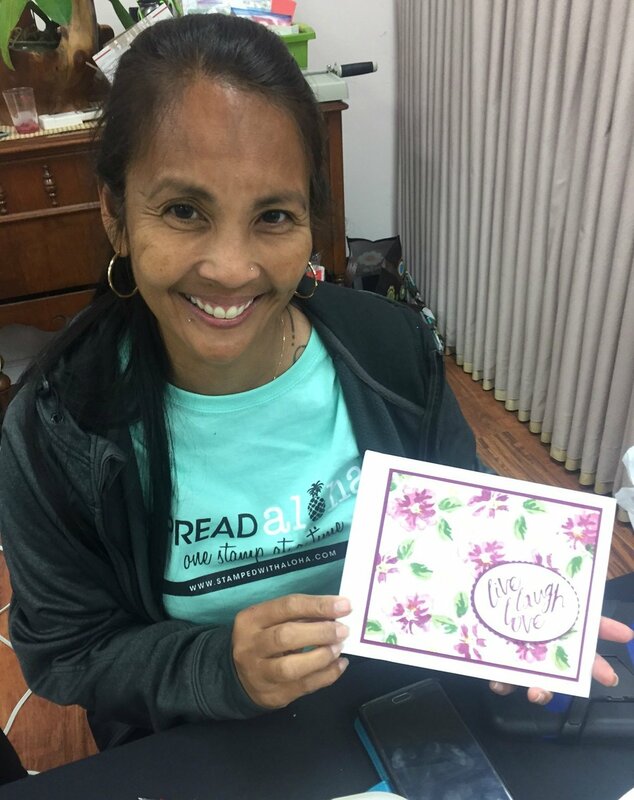 Whether it is in sharing words of encouragement, giving a hug or blessing someone with a hand stamped creation know that you can truly make a difference in this world, one stamp at a time!